Blood is pumped around your body by your heart through veins and arteries. It delivers oxygen and important nutrients to keep your body working. When there is something wrong with your heart or blood vessels, this is called heart (cardiovascular) disease. Heart disease is the biggest killer in Fiji with over 1,000 cases reported each year. Congestive Heart Failure doesn’t mean the heart has stopped working but rather, it isn’t able to pump enough blood to meet the needs of the body. This may happen for different reasons; the heart muscle might be weaker that normal, there may be a defect in the heart preventing the blood flowing normally. When the heart does not circulate blood properly, the kidneys receive less blood and so filter out less fluid into the urine. This extra fluid in circulation builds up in other areas in the body such as eyes, lungs and legs. This fluid is called “congestion” which is what gives this heart disease its name. Shortness of breath – most commonly during activity, also when resting or sleeping which may wake you up. You may experience difficulty breathing when lying flat and so have to prop your upper body up to relieve the difficulty. You often wake up feeling tired or anxious and restless. Coughing and wheezing – that may produce white or pinkish mucus with a hint of blood. Excess fluid in the body – this can result in swelling in the feet, ankles, legs or abdomen. Your shoes may feel tighter or you noticeably gain weight. Tiredness – feeling tired all the time and finding everyday activities hard, even shopping or walking feels difficult. Confusion, not thinking properly – you may not feel yourself, confused or disorientated. Your friends or family may notice this before you do. Fast heart rate – you may notice your heart beating faster, like it is racing or throbbing. 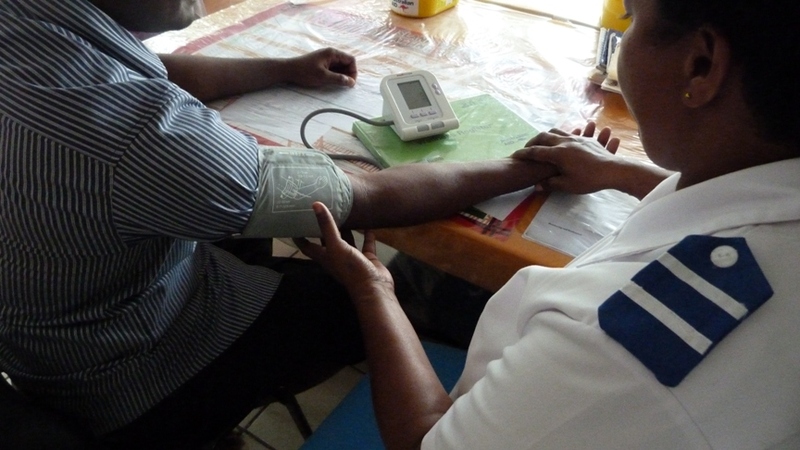 Hypertension is Fiji’s second most common heart disease, it is also known as high blood pressure. Blood pressure is the measure of the force of blood against your artery wall. Anyone can develop hypertension; it increases your risk of heart attack or stroke. There are generally no warning signs or symptoms for high blood pressure, so it is important you get tested by your doctor or health professional, they will be able to measure your blood pressure. Whilst blood pressure can go up and down throughout the day, if it remains high for a long period of time (around 3 months) then you have high blood pressure. See below for a chart that explains how your blood pressure is measured. There are many lifestyle factors that can put you at risk of hypertension. You should eliminate the risk factors above. There is also blood pressure lowering medication that you can take, but only as directed by your doctor. If you are at risk of high blood pressure or do have high blood pressure, you should have regular health checks, at least once a year. Speak to your health worker to learn more. Ischaemic Heart Disease (IHD) is also known as Coronary Heart Disease and causes heart attacks by restricting blood flow to the heart. 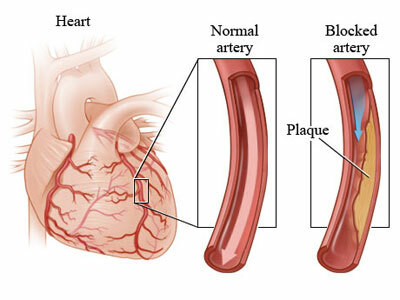 IHD is caused by a build up of plaque along the inner walls of your heart (coronary artery), this plaque eventually thickens and hardens, obstructing the blood flow and causing a heart attack. The signs and symptoms of IHD only become obvious once it is in an advanced state, which is why heart attacks may seem “sudden” or unexpected. This is because IHD can build up over a very long time, even decades, before symptoms are felt. Early symptoms include angina (chest pain), especially when exerted or having done exercise as well as decreased exercise tolerance (Stable IHD). Unstable IHD presents itself as chest pain or other symptoms and rapidly worsening angina. A common earlier symptom of IHD is Angina (chest pain) that usually occurs when exercising. You heart can’t get enough oxygen to work properly because the arteries that are carrying the blood to the heart get too narrow. If you’ve had any of these symptoms, talk to your local doctor or nurse immediately. A heart attack can occur when the flow of blood to a section of your heart becomes blocked, preventing the blood from moving through your heart. If the flow is not restored quickly enough, that section of your heart muscle dies. 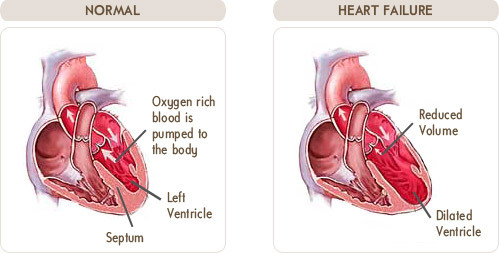 You may experience some of the following symptoms when you are having a heart attack. Be aware that you may also not feel any pain at all. If you think you or someone else may be having a heart attack, call an ambulance or go to hospital immediately. Early treatment can save your life. An unhealthy lifestyle puts you at much greater risk of heart disease. It is the number one killer in Fiji and the world. There are some very simple steps you can take to reduce your risk of heart disease. It all has to do with a healthy lifestyle. If you follow these steps you are also lowering your risk of many other diseases. All types and levels of smoking is very bad for your heart. Smoking increases your blood pressure and heart rate and reduces oxygen in the blood. If you quit smoking completely, your body can repair itself and within 5 years, your risk of heart disease can drop to that of a non-smoker. If you do choose to drink, it is much better for your heart if you moderate the amount you drink and make sure you don’t drink too much. For adult females and adult males over the age of 65, a maximum of one drink per day is a healthy amount. For adult males under the age of 65, a maximum of two drinks per day is a healthy amount. Any more than the above levels of Alcohol is a hazard to your health. You should aim to get at least 30 – 60 minutes of moderately intense physical activity on most days of the week. Sticking to this exercise routine will benefit your entire body, not just your heart. Even short bursts of 3 x 10 minute exercise sessions each day can benefit. Limiting certain fats you eat also is important. There are different types of fat — saturated fats should be limited and trans fats should be kept out of your diet altogether. Rather than the above types of fats, you should include more ‘healthy fats’ from natural foods such as avocado, nuts, fish and olive oil. Not only are they tasty, they also help your heart by reducing the bad cholesterol. You should up your daily fruit and vegetable intake to at least 2 servings of fruit and 3 servings of vegetables a day, but the more the merrier,10 servings a day would be even better! There is salt hidden in lots of foods, especially packaged and processed foods, in fact about 75% of the salt we eat is from processed food such as tinned foods and tomato sauce. Reducing salt in your diet doesn’t have to be hard and by doing so, you can reduce your blood pressure which means you reduce your risk of heart disease and stroke. No more dipping food and meats in salt, you only need a small pinch of salt! Being overweight, especially if you carry lots of weight around your middle, increases your risk of heart disease. Excess weight can lead to conditions that increase your chances of heart disease such as high blood pressure, high cholesterol and diabetes. Even a small amount of weight loss can be of benefit and reduce your risk of these diseases. A lack of good quality sleep can really harm your health. People who don’t get enough sleep have a higher risk of obesity, high blood pressure, heart attack, diabetes and depression. If you feel tired and want to keep sleeping when you wake up in the mornings, you are probably not getting enough sleep. Adults should aim for around 7 – 9 hours sleep each night, you should make sure you have a good routine in place and stick to it, make sure your room is dark and quiet to make sleeping easier. Getting enough sleep each night should be a priority. A Healthy diet and daily exercise help you sleep better at night.